A U.S. official has said investigators are examining the possibility that the disappearance of a Malaysia Airlines jet was 'an act of piracy'. Key evidence for 'human intervention' is that even after the plane's transponder ceased contact an hour into the flight, a routine monitoring system sent a message to a satellite indicating that the plane had turned to the west in a dramatic change of direction - before that system, too, was disabled. While theories continue to swirl round the vanishing of flight MH370, the probe has sharpened its focus on sabotage. 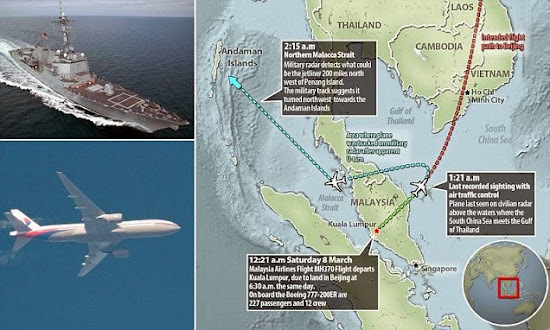 New Malaysian military radar evidence shows the plane climbed to 45,000ft - 2,000ft above a Boeing 777's recommended limit - which could have knocked its passengers unconscious in a deliberate attack. Other theories state the plane's cargo of highly flammable lithium batteries could have ignited, that it was crashed as a pilot's suicide or even that it landed safely in a secret location. Speaking to the New York Times, a Malaysian official said the plane is recorded as shooting up to 45,000 feet, and shortly afterwards descending to the unusually low altitude of 23,000ft. A further source suggested that the reading supports the idea of a hijack attempt, as flying above 43,000ft could, if the cabin were depressurised, knock out the people on board. But some experts questioned the reliability of the data, saying such a steep descent would be unlikely and that the readings do not 'make sense'. As the search continued for the missing Boeing 777, which vanished with 239 people on board last Saturday, military radar suggested the plane was deliberately flown towards India's Andaman Islands. Two sources familiar with the investigation said an unidentified aircraft - which investigators believe was flight MH370 - was plotted by military radar following a route between navigational waypoints. The last plot on the military radar's tracking suggested the plane was flying towards India's Andaman Islands, a chain of isles between the Andaman Sea and the Bay of Bengal, they said. All the sources, quoted by various news agencies, declined to be identified because they were not authorised to speak to the media. Malaysian Transport Minister Hishammuddin Hussein said he could not confirm the last heading of the plane or if investigators were focusing on sabotage. 'A normal investigation becomes narrower with time... as new information focuses the search, but this is not a normal investigation,' he told a news conference. Investigators were still looking at 'four or five' possibilities, including a diversion that was intentional or under duress, or an explosion, he said. Police would search the pilot's home if necessary and were still investigating all 239 passengers and crew on the plane, he added. It came shortly after an aviation expert suggested that pilot suicide could be an explanation, citing previous incidents in the 1990s. Mike Glynn, a committee member of the Australian and International Pilots Association, cited a SilkAir crash during a flight from Singapore to Jakarta in 1997 and an EgyptAir flight in 1999. 'A pilot rather than a hijacker is more likely to be able to switch off the communications equipment,' Glynn said. Glynn said a pilot may have chosen to fly the plane into the Indian Ocean to reduce the chances of recovering data recorders, and to conceal the cause of the disaster. Another source speaking to the New York Times suggested a rival line of enquiry - that a cache of batteries being transported on the plane caught fire and brought it down. The U.S. source said a 'significant load' of Lithium batteries - which are prone to catching fire, and burn with an intense heat - were among the plane's cargo. Such accidents have brought down planes in the past, but the theory is at odds with the growing consensus that the plane kept flying for hours after its last known contact. The Wall Street Journal reported yesterday that 'pings' sent from missing flight 370 provided the plane's location, speed and altitude for at least five hours after it vanished from radar. If the plane did carry on flying for that time it could have travelled 2,200 nautical miles, possibly reaching north-western India and the border with Pakistan.